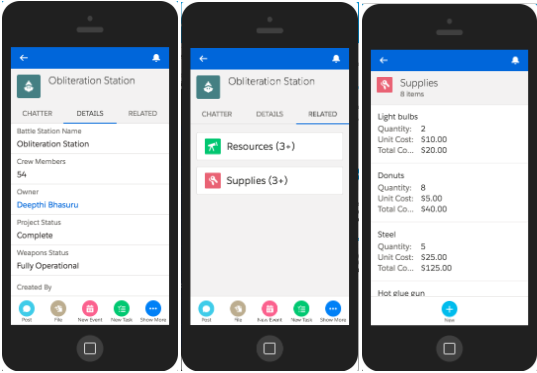 Create a Quick Action in the Salesforce mobile app. Your boss is always on the go, flying from one planet to the other. Your boss is determined to have a mobile app to fire off Battle Station requests from any part of the galaxy. The only problem is that your team doesn't have any mobile developers, and the boss is not gonna be happy. However, when using Salesforce you instantly become a mobile developer! Using point-and-click features such as mobile navigation, compact layouts, and actions, you can mold the Salesforce mobile app into a powerful tool that your boss can use from any planet with cell reception. As a downloadable app from the App Store and Google Play™. As a mobile browser app that runs in supported mobile browsers. This option doesn’t require anything to be installed. For this step, we'll use the last option, because it's an easy way to develop and test. If you are using a Trailhead Playground and don't know your username and password, you'll need to get those now. Follow the steps in this article. Open a browser on your phone or tablet and navigate to http://login.salesforce.com. Log in with your Trailhead Playground/Developer org credentials. Once logged in, click the three little lines in the upper left (the navigation icon). In the Recent section of the navigation menu, click the More menu item to display the Battle Stations option. Click on Battle Stations. Selecting any one of your Battle Station records will display the record view with it's Chatter feed, detail, and related information pages, which you can swipe left and right to see. This is great! Now your boss, and your entire team, has access to your Salesforce data from anywhere in the galaxy. However, you immediately realize that your boss has too much power and that typically makes for a bad afternoon. You need to make it easy to quickly enter data with a limited number of fields. Those bulky gloves are prone to errors. You want to make it as easy as possible for your boss to enter new records, so you'll make a button that is available from anywhere in the Salesforce mobile app and provides him with a single field to enter the Battle Station name to minimize confusion. First let's create the Quick Action. Quick Actions are things you want to do immediately from your mobile device such as entering the name of a new Battle Station. These actions live in a special place called the Publisher. You can customize the Publisher so that your most important actions are there at your fingertips. From Setup, enter Global Actions in the Quick Find, then select Global Actions. Leave the Action Type as Create a Record. In the Target Object field, choose Battle Station. In the Label field, enter New Battle Station. In the next Action Layout screen, leave Battle Station Name as the only field in the layout. Now you need to add that Quick Action to the Publisher. The Publisher Layout determines which Quick Actions you see in the Action bar at the bottom of the Salesforce mobile app. From Setup, enter Publisher Layouts in the Quick Find, then select Publisher Layouts. Salesforce puts several Quick Actions in the Publisher by default. Feel free to remove any that you'd like by clicking it in the Global Publisher and dragging it up to the Global Layout area. Now add your New Battle Station action by dragging it from the Global Layout and dropping it into the Global Publisher below. You can move the actions around. Drag New Battle Station to the left so that it appears first. It's easier to find this way. Go back to the Salesforce mobile app and click the navigation icon (the three little lines) in the upper left and select the Chatter menu item. When the page opens, you'll see some icons on the bottom. The first icon should be your Quick Action that creates a new Battle Station. However, you may have to click the Show More icon to find it. Click the New Battle Station icon. In your org, this action might be represented with an icon different from the Bottle icon that you see below. Give the Battle Station a name and click Save. Now your boss can quickly and easily enter a new Battle Station record with a minimal amount of effort. You've done a lot in a relatively short period of time. You not only created an app to manage construction projects, but you customized the Salesforce app mobile app as well. How does it feel to be a mobile developer? Most importantly, you’ve created a customized experience for your boss and your entire crew, enabling you to build battle stations on time, on budget, and for millennia to come.